On 11 October -- International Day of the Girl -- girls take over the positions of hundreds of leaders in sixty countries in an emphatic statement of their power and potential. The OECD is pleased to take part in this initiative organised by PLAN International, one of the world’s largest development NGOs. (Read highlights from last year’s event showing how girls took over the world.) As part of this campaign, a teenage girl from Indonesia named Alda came to the OECD for a #GirlsTakeover event on 11 October. 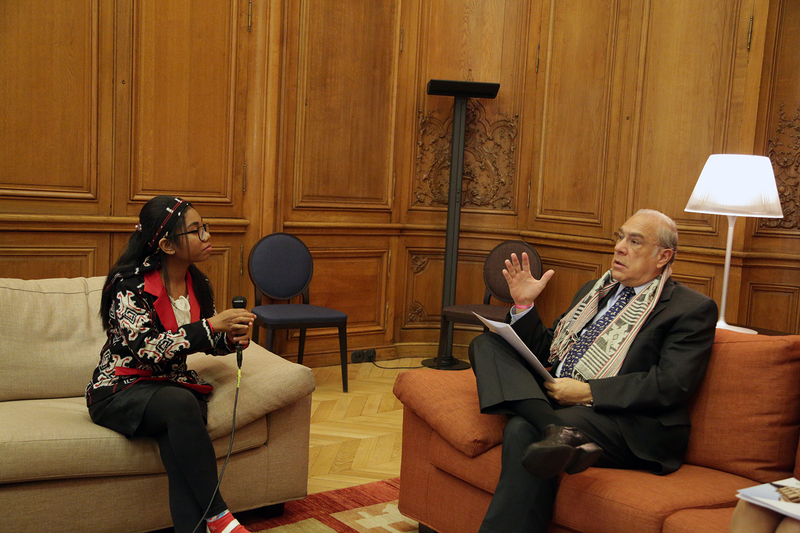 Alda, an advocate for girls’ education and ending child marriage – was briefed by staff, toured the premises, and interviewed Secretary General Angel Gurría. When asked about gender equality, Alda says that “It’s not just about teaching girls about what they deserve, but also to the boys about how girls should be treated. Therefore everyone should work together, hand in hand, in order to make gender equality happen”. Through her advocacy, she has noticed that violence against women and girls is a problem in her community and that girls are still perceived as being of lesser value than boys, a problem related to a lack of education. She is aware that gender norms still prevent many girls from realising their true potential since they are expected to be “the servant of their husband and families” and are often victims of child and forced marriages. Alda is a member of the Youth Coalition for Girls, Plan International’s partner, which focuses on girls’ education. Along with a local youth movement, she runs a free teaching class for poor children as well as campaigns related to children’s rights and child marriage prevention. On 4 October, the OECD launched The Pursuit of Gender Equality - An Uphill Battle. This report details how gender inequalities persist in all areas of social and economic life and around the world. Young women in OECD countries generally obtain more years of schooling than young men, but women are less likely than men to engage in the labour market. Gaps widen with age, as motherhood typically has marked negative effects on gender pay gaps and career advancement. Women are also less likely to be entrepreneurs, and are under-represented in private and public leadership positions. In the face of these persistent challenges, progress has been slow. Governments must do more to close gender gaps in education, employment, entrepreneurship and public life. The book presents a range of statistical indicators illustrating gender gaps, with content on education, employment, migration, public life, and violence against women. The report also highlights recent “best practice” policy initiatives, such as pay transparency measures to reduce gender wage gaps and incentives to get fathers to parental leave.